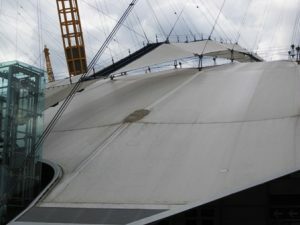 The O2 (originally called the Millenium Dome) ia a 380 metre wide, 50 metre high fibreclass cupola supported by 12 yellow 110 metre steel masts. 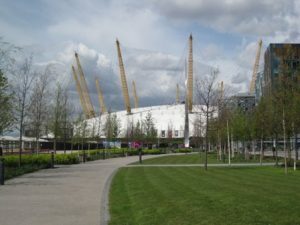 The O2 houses exhibition space, a concert arena, an 11 screen multiplex cinema, a nightclub and restaurants and bars which are located on Entertainment Avenue and which are open 7 days a week. The O2 will host gymnastic and basketball events during the Olympic and Paralympic Games. It has been renamed the North Greenwich Arena for the duration of the games. This is in order not to offend the sensibilities of Olympic Games sponsor British Telecommunications which is a competitor to mobile phone company O2 after which the Arena is normally branded. The Arena lies within an independent building housed within the main dome structure. It has 23,000 seats and is jointly the largest indoor arena in Europe. It has hosted such acts as Madonna. Prince, Led Zeppelin, Justin Timberlake and Barbera Streisland. The exhibition space has been used to display the treasures found in the tomb of Egyptian pharaoh Tutankamun. IndigO2 is a 2,400 capacity entertainment venue within the dome used for smaller concerts and as a club. On display in the O2 is a permanent exhibition called The British Music Experience billed as Britain’s Museum of Popular Music History. It occupies nearly 2,000 square metres and traces the history of popular music from 1945 to the current day in 7 zones connected by a timeline. It includes items such as Spice Girls costumes, Noel Gallagher’s Union Jack guitar, David Bowie’s Ziggy Stardust outfit, Paul Weller’s Rickenbacker, Duffy’s Rockferry Jacket and Amy Winehouse’s Dress from ‘Tears Dry on Their Own’. It also has numerous interactive exhibits, many developed by major music software providers. The museum is open every day from 11:00 am to 7:30pm. Tickets are £12 for adults and £6 for children. Recently opened is Up at the O2 – the O2’s latest attraction. This involves a guided walk over the top of the O2 Dome. 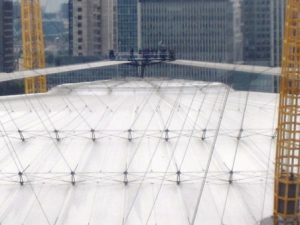 Groups of 15 are kitted out, given safety harnesses and taken up a suspended tensile fabric walkway suspended from the O2’s masts – there are no handrailsto the sides – just a central cable that you clip on ton. At the top is a 53 metre high circular viewing platform – the equivalent in height to a 20+ storey building. You can wander around the platform which has an uninterrupted 360 degree view, you can see the Shard to the west, Canary Wharf to the north across the river and the Thames Barrier to the east. The O2 is served by public transport: The adjacent North Greenwich London Underground Station is one stop from Canary Wharf on the Jubilee Line, there is a major buses terminal next to the station, the London River Boat Service at Queen Elizabeth II pier provides fast transport via the river to piers to Central London and services on the nearby Emirate Airlines London Cable Car to Royal Victoria Dock will commence soon.